As part of D.C. Eats: Summer of Food, we’ve invited foodies and chefs from around the city to guest blog about their favorite food-focused work of art in The Phillips Collection. Erik Yang is chef at Taiwanese ramen and dumpling haven Toki Underground in the Atlas District. Read more posts in the Summer Menu series here. Paul Gauguin, The Ham, 1889. Oil on canvas, 19 3/4 x 22 3/4 in. The Phillips Collection, Washington, D.C. Acquired 1951. Indeed it is a ham . . . but it isn’t any ham, I suppose. 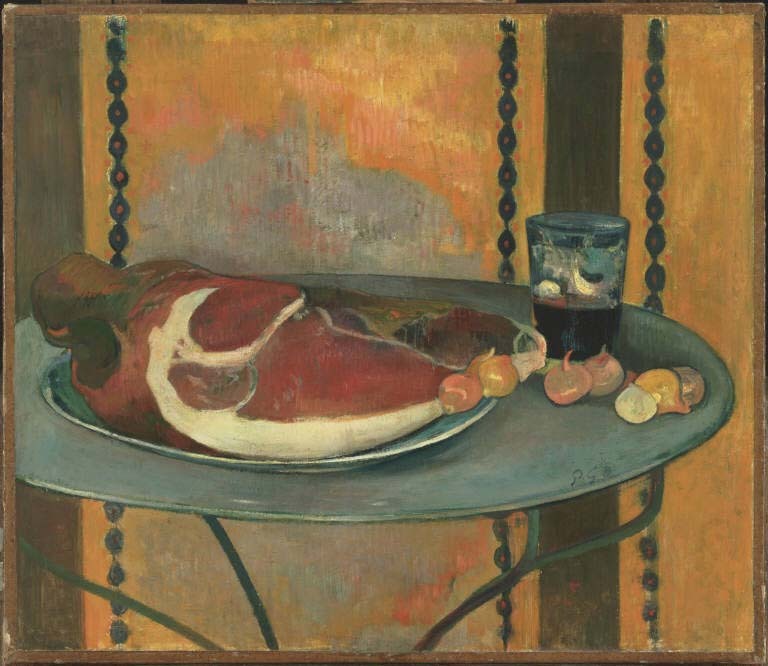 This lucky ham had the privilege of being painted by Gauguin. But the real question is — are those beets or shallots next to the ham? Is this a piece of pork roasted, cured, or raw? An even better question to pose is — was this ham part of his late night regimen: a little proscuitto, a little wine, a little pickles, a little art. I never understood the desire to paint still lifes of food, but maybe this was a 19th century way of food blogging about your favorite meal or favorite place to eat. Little onions are placed next to the ham. These were special onions grown in Brittany and savored by the Brits across the channel. French farmers loaded these tasty morcels in baskets on their bicycles. They crossed on the ferry to the English countryside to sell to the locals. These onion venders were know as “Onion Johnies”. That is awesome. Thank you for the update and the comment.